As many of you have heard or seen or even been lucky enough to witness in person during the Round 4: All In event at Las Vegas Motor Speedway this past weekend during the tandem battle between Ryan Tuerck and Katsuhiro Ueo contact between the 2 cars was made and Tuerck’s Mobil 1 / Gardella Racing Pontiac Solstice performed now the infamous “bunny hop.” All 4 tires left the ground in dramatic fashion and Tuerck was able to continue on his way to battle it through the competition. During the competition Formula DRIFT decided that a unique action sequence like this must of been captured with photo or video. An announcement was made by the voice of Formula D, Jarod DeAnda for all fans and media members that were able to capture this unique moment to submit the photo to Formula D for a chance to win a prize. The FD Twitter page also was going crazy with submissions and fans wanting to see more. 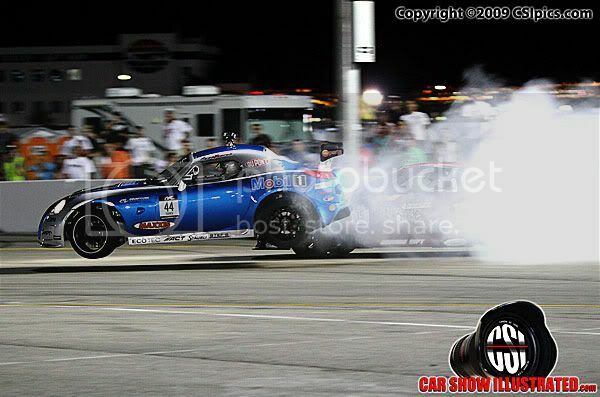 So due to popular demand here is the 1st Formula DRIFT Photo Contest. Formula DRIFT has teamed up with Fatlace F/Stop Channel to award 1 winner with a Fatlace Package. The winning submission will also be featured in an upcoming Formula DRIFT ad in Super Street, Modified, and Import Tuner. Submissions will be narrowed down and judged by Formula DRIFT official photographer and director of photography for Fatlace, J.Martinez. For those that haven’t seen any footage here is a quick video submitted by a fan.